Join Little Santa in delivering Christmas gifts to every good boy and girl! Who’s that wriggling down the chimney, and rustling behind the Christmas tree? 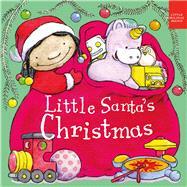 It’s LITTLE SANTA, flying on her sled with a sack full of surprises—like drums, choo-choo trains, and a bouncy ball. And when Little Santa finishes her busy Christmas ride there’s something special waiting for her at home: cookies, milk, and a BIG hug! This sweet and simple holiday story will delight small children. Algy Craig Hall earned an MA in Children’s Book Illustration from Cambridge School of Art. His previous titles include Dino Bites! and Fine As We Are (both Boxer Books). Algy lives in London.